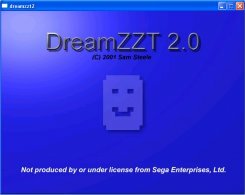 DreamZZT is a ZZT emulator on the Dreamcast. It is a unique project, as it is the first real EMULATION of ZZT on a console. 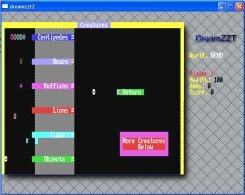 Unlike other ZZT clones, it is constantly revised and updated. To run DreamZZT properly, you will need a Dreamcast and a CD burner. Once you have both of these things, download the Dreamcast Binary or get different CD images from Dream ZZT's frequently updated website. Burn the Image and it should run on your Dreamcast. Cool! 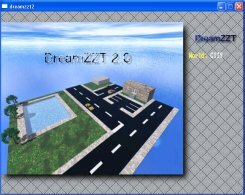 Of course, DreamZZT is not just for Dreamcast users. Sam has also ported it over to Win32, which makes it the most complete Win32 clone/port of ZZT ever. I loaded up to play around with it, and it looks quite promising. Don't get too excited yet, though; it can't do that much. However, it's certainly a step in the right direction, and we commend Sam for his project. You can download the Dreamcast Binaries or the Win32 Binaries here, and we will try to keep up with the latest news and versions of DreamZZT. Please visit Sam's page and show your support--you'll also find more files to download, including some games to play on the DC and the DOS binaries.� In the meantime, here are some screenshots I took on WinXP.